Dos nuevos hechos marcan una nueva tendendencia en el impacto que Internet esta teniendo en la humanidad, esta vez en el aspecto educacional. El primer hecho es la nueva iniciativa que esta liderando Anant Arwal con el respaldo de Harvard-MIT con el objeto de crear un sistema que ponga a disposicion de «todo el mundo» la educación de tal manera que el acceso a la misma sea universal. El segundo hecho es el acelerado ritmo con que Internet se esta volviendo accesible a millones de personas, he aqui la noticia de una Tablet lanzada en India con un costo en tiendas de $64. If you were asked to name the most important innovation in transportation over the last 200 years, you might say the combustion engine, air travel, Henry Ford’s Model-T production line or even the bicycle. The list goes on. Don’t worry if you come up blank. You’re supposed to. The question is a gambit used by Anant Agarwal, the computer scientist named this year to head edX, a $60 million MIT-Harvard effort to stream a college education over the web, free, to anyone who wants one. His point: It’s rare to see major technological advances in how people learn. Agarwal believes that education is about to change dramatically. The reason is the power of the web and its associated data-crunching technologies. Thanks to these changes, it’s now possible to stream video classes with sophisticated interactive elements, and researchers can scoop up student data that could help them make teaching more effective. The technology is powerful, fairly cheap and global in its reach. EdX has said it hopes to teach a billion students. Online education isn’t new—in the United States more than 700,000 students now study in full-time “distance learning” programs. What’s different is the scale of technology being applied by leaders who mix high-minded goals with sharp-elbowed, low-priced Internet business models. SEE ALSO: The Crisis in Higher EducationThese ideas affect markets so large that their value is difficult to quantify. Just consider that a quarter of the American population, 80 million people, is enrolled in K–12 education, college, or graduate school. Direct expenditures by government exceed $800 billion. Add to that figure private education and corporate training. Because education is economically important yet appears inefficient and static with respect to technology, it’s often cited (along with health care) as the next industry ripe for a major “disruption.” This belief has been promoted by Clayton Christensen, the influential Harvard Business School professor who coined the term “disruptive technology.” In two books on education, he laid a blueprint for online learning: It will continue to spread and get better, and eventually it will topple many ideas about how we teach—and possibly some institutions as well. In Christensen’s view, disruptive technologies find success initially in markets “where the alternative is nothing.” This accounts for why online learning is already important in the adult education market (think low-end MBAs and nursing degrees). It also explains the sudden rise of organizations such as Khan Academy, the nonprofit whose free online math videos have won funding from Bill Gates and adoring attention from the media. Khan gained its first foothold among parents who couldn’t afford $125 an hour for a private math tutor. For them, Salman Khan, the charming narrator of the videos, was a plausible substitute. Digital instruction faces limits. Online, you will never smell a burning resistor or get your hands wet in a biology lab. Yet the economics of distributing instruction over the web are so favorable that they seem to threaten anyone building a campus or hiring teachers. At edX, Agarwal says, the same three-person team of a professor plus assistants that used to teach analog circuit design to 400 students at MIT now handles 10,000 online and could take a hundred times more. 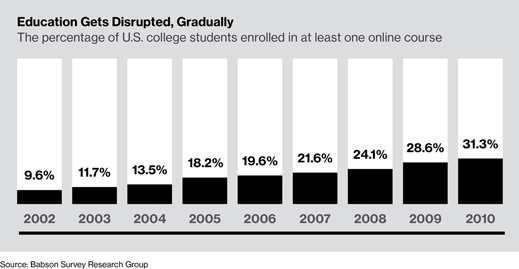 So where are we on the online education curve? According to a study from Babson College, the number of U.S. college students who took at least one online course increased from 1.6 million in 2002 to 6.1 million, or about a third of all college students, in 2010. The researchers, I. Elaine Allen and Jeff Seaman, found signs that the growth rate of online classes might be starting to slow. But their study didn’t anticipate the sudden entry of premier universities into online education this year. Coursera, an alliance between Stanford and two dozen other schools, claims that it had 1.5 million students sign up. 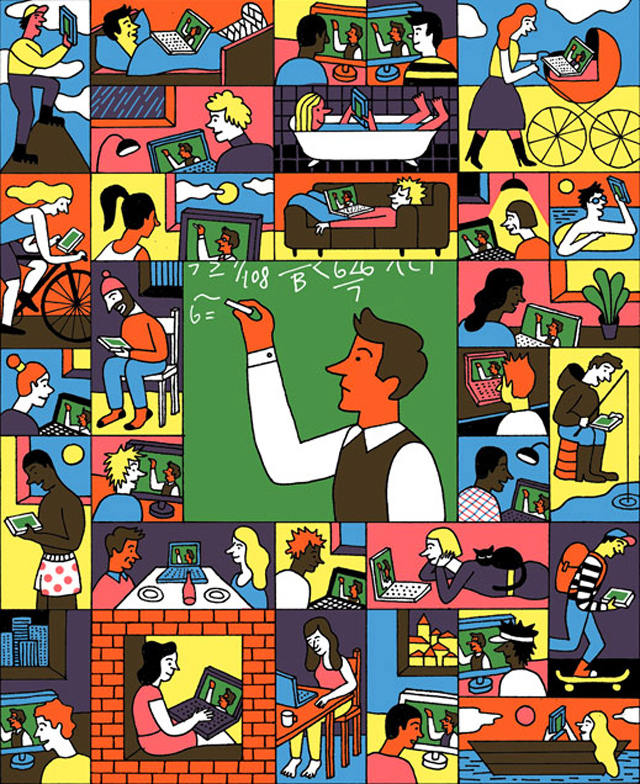 Even though only a small fraction of those will actually complete a class, the rise of the MOOCs means we can begin thinking about how free, top-quality education could change the world. Khan’s videos are popular in India, and the MOOC purveyors have found that 60% of their sign-ups are self-starters from knowledge-hungry nations like Brazil and China. Nobody knows what a liberal application of high-octane educational propellant might do. Will it supersize innovation globally by knocking away barriers to good instruction? Will frightened governments censor teachers as they have the web? Technology will define where online education goes next. All those millions of students clicking online can have their progress tracked, logged, studied and probably influenced, too. Talk to Khan or anyone behind the MOOCs (which largely sprang from university departments interested in computer intelligence) and they’ll all say their eventual goal isn’t to stream videos but to perfect education through the scientific use of data. Just imagine, they say, software that maps an individual’s knowledge and offers a lesson plan unique to him or her. Will they succeed and create something truly different? If they do, we’ll have the answer to our question: Online learning will be the most important innovation in education in the last 200 years. This article originally published at MIT Technology Review here. UK company Datawind has launched its Aakash 2 tablet in India. It’s an Android device which will be available to students at an extremely low price. The Aakash 2 tablet sports a 1GHz Cortex A8 processor, 512MB of RAM, 4GB of memory (expandable to 32GB via a microSD card) and a 7-inch capacitive display with a 800×480 pixel resolution — not exactly top of the line, but enough to get most tasks done. 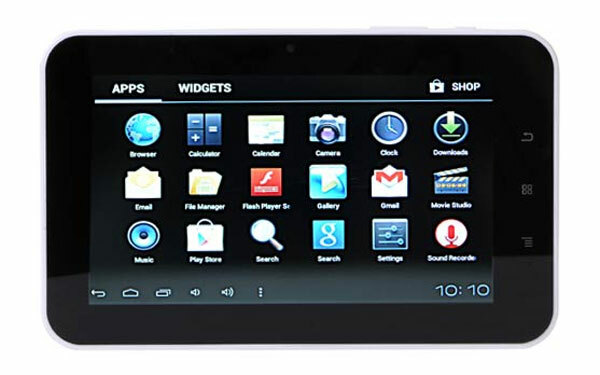 The tablet will run on Android 4.0, another big improvement over the original Aakash, which came out last year and was extremely low-specced, sporting a 366 MHz CPU and Android 2.2.